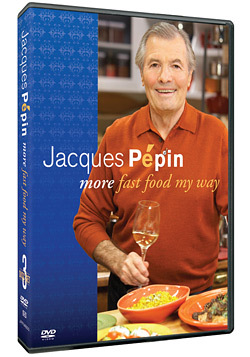 Buy the 26-episode Jacques Pépin: More Fast Food My Way DVD set and watch Jacques Pépin wherever and whenever you want. Watch in your kitchen while you cook along or on your laptop during a long flight, because with these DVDs, Jacques is portable! Filmed in High Definition, Jacques and his food has never looked tastier. 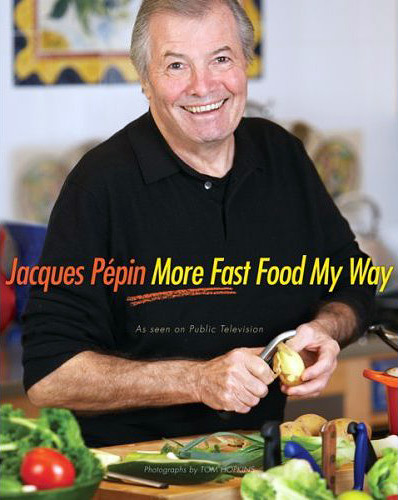 Invite Jacques Pépin into your kitchen every day of the week with Jacques Pépin: More Fast Food My Way, the companion cookbook to the KQED series. With this cookbook, you will have every last recipe from the show at your hungry fingertips, along with over 100 sumptuous color photographs and Jacques' personal cooking tips and insights. While Jacques Pépin: More Fast Food My Way includes many recipes that take our busy lives into consideration, there are also plenty of elegant and festive dishes for entertaining, including stuffed pork tenderloin, pumpkin gratin, and coffee-poached pears. Photographs from Jacques Pépin: More Fast Food My Way by Tom Hopkins. Copyright 2008. Reprinted by permission of Houghton Mifflin Company. All rights reserved.